This weekend Washington High School will perform Seussical. The show will have three performances. The first two — Friday, Feb. 15, and Saturday, Feb. 16 — will begin at 7 p.m. The final performance will be on Sunday, Feb. 17 and will start at 2 p.m. Mayzie La Bird, played by Jocelyn T., sits on the beach while Jose the Poolboy, played by Ray D., fans away her troubles. This weekend, the community can watch their childhood come back to life at the Washington Historic Theater (Historic Washington Middle School Auditorium). Horton the Elephant, the Cat in the Hat, and all of your favorite Dr. Seuss characters will spring to life onstage in “Seussical,” a fantastical musical extravaganza from Tony-winners, Lynn Ahrens and Stephen Flaherty. A show sure to entertain audiences of all ages, join Washington High School as audiences are transported from the Jungle of Nool to the Circus McGurkus, and everywhere in between. The show will have three performances. The first two — Friday, Feb. 15, and Saturday, Feb. 16 — will begin at 7 p.m. 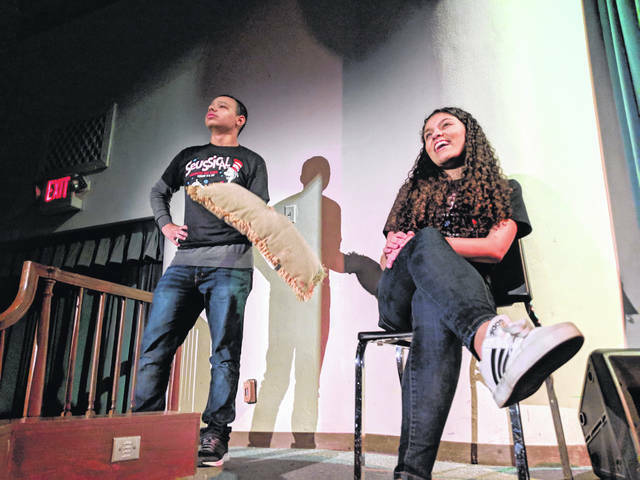 The final performance will be on Sunday, Feb. 17 and will start at 2 p.m. All shows will be performed at the Washington Historic Theater on Temple Street in Washington Court House. Tickets are $10 and are available online at “https://whsoh.booktix.com,” with links on the district homepage and Facebook page. Tickets will also be available at the door. This is not the first time the Blue Lions have presented the tales of Dr. Seuss. All members of the original WHS 2006 Seussical cast are invited to join the reunion on Saturday, Feb. 16. This event will include a cast meet-and-greet, happy hour, discounted tickets, a curtain call performance, and a post-show 2006 cast party. All original cast and crew members should contact Trevor Patton — director of marketing and communications for the Washington Court House City Schools — at 740-335-6620, extension 5027 for more information and to reserve a spot. https://www.recordherald.com/wp-content/uploads/sites/27/2019/02/web1_IMG_20190206_203037-1.jpgThis weekend Washington High School will perform Seussical. The show will have three performances. The first two — Friday, Feb. 15, and Saturday, Feb. 16 — will begin at 7 p.m. The final performance will be on Sunday, Feb. 17 and will start at 2 p.m. Mayzie La Bird, played by Jocelyn T., sits on the beach while Jose the Poolboy, played by Ray D., fans away her troubles.